Syrian pro-regime fighters initiated an unprovoked attack against Syrian Democratic Forces headquarters, where coalition service members were co-located, Wednesday, according to military officials. Syrian Democratic Forces, the U.S.-backed mix of Kurdish and Arab fighters, acted in self-defense to repel the attack in eastern Syria late Wednesday and early Thursday, Col. Thomas Veale, a spokesman for the Inherent Resolve coalition, told Military Times. The assault appeared “to be a coordinated attack on Syrian Democratic Forces approximately 8 kilometers east of the Euphrates River de-confliction line in Khusham, Syria,” Veale said. Forces loyal to Syrian President Bashar al-Assad’s regime began the attack with 122mm artillery pieces, according to Veale. 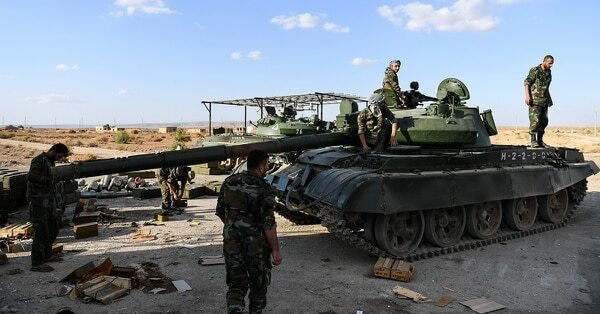 The pro-regime forces maneuvered T-55 and T-72 main battle tanks with support from multiple-launch rocket systems and mortars against the SDF forces headquarters, he said. 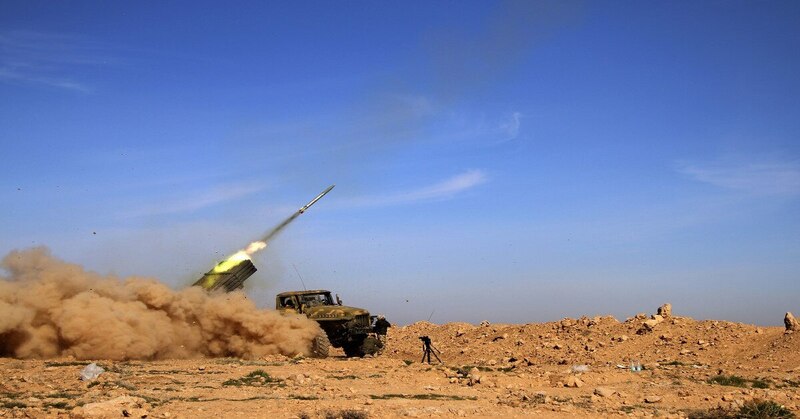 “After 20 to 30 artillery and tank rounds landed within 500 meters of the SDF headquarters location, [SDF] supported by the Coalition targeted the aggressors with a combination of air and artillery strikes,” Veale said. Because coalition advisers were with the SDF in an advise, assist and accompany capacity, “this action was taken in self-defense,” he added. Additionally, fleeing pro-regime vehicles and personnel who headed back west were not targeted, according to Veale. The coalition had been aware of a massing of pro-regime forces over the past week. Experts from the U.N. and the chemical weapons watchdog are blaming Syria’s government for a sarin nerve gas attack that killed over 90 people last April. Russian officials assured Inherent Resolve they would not engage coalition forces in the vicinity, Veale added. One SDF soldier was wounded during the assualt, but there were no coalition casualties, he said, adding that there also was no number of casualties on the pro-regime side he could report at this time. Veale wouldn’t break down the aircraft nationality or platform used to conduct the strike, and couldn’t disclose the number of coalition advisers on the ground during the assault. “We also cannot speculate on the exact makeup of the Syrian pro-regime forces who conducted the attack at this time,” he added. In addition to the Syrian army loyal to Assad, pro-regime forces are supported by Iranian-backed militias and Russian forces. “In defense of Coalition and partner forces, the Coalition conducted strikes against attacking forces to repel the act of aggression against partners engaged in the Global Coalition’s defeat-Daesh mission,” a statement from U.S. Central Command said, using the Arabic acronym for the Islamic State (ISIS). 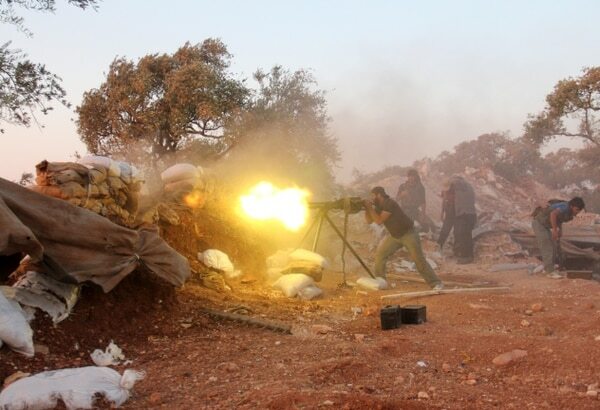 This is not the first clash between coalition and pro-regime forces in the Syrian civil war. One other incident occurred last June, when a U.S. Navy F/A-18 Super Hornet shot down a Syrian regime Su-22 jet that had attacked U.S.-backed forces on the ground. “The Coalition remains committed to focusing on the defeat-Daesh mission in the Middle Euphrates River Valley and asserts its non-negotiable right to act in self-defense,” the CENTCOM statement added.